The portrayal of personages and events from Christianity remains an important part of the 19th-century artistic education. However, religious art swiftly lost importance in the 19th Century and for the first five years of his career, Ensor paid no heed to it. It was only, around 1885 or 1886, after he became familiar with the symbolic images of Odilon Redon that anew, and until late in life, religious themes were dealt with in circa 70 drawings, etchings, lithographs and paintings. In the first place, he chose subjects in which daemons could play a leading role, such as the various versions of The Temptation of Christ (1888) and St. Anthony or the Fall of the Rebel Angels (1889). Just as crucial for the development of a new artistic style, are the subjects such as Christ Calming the Storm, of which he made several etchings (1886, 1898) and canvas oil paintings (1891, 1906 (Museum of Ixelles, Brussels), etc.). To further consider is Adam and Eve Expelled from Paradise (1887), in which Ensor exploits in full the spectacular possibilities of the surreal. From the onset, he chose for a humourous approach. The Multiplication of the Fish (1891) and Auto-da-fe (1891) betray anti-clerical and socially-critical intentions. In the drawing, Christ Mourned by the Angels (1886, private collection) and the painting Man of Sorrows (1891) he makes his departure from an art historical persiflage. In only two examples, Ensor explicitly identified himself with Christ: first, in a drawing, Calvarie (1886) Ensor’s name hangs over Christ’s head and Christ is pierced in his side by the art critic Fétis. This same Fétis appears again alongside the critic Max Sulzberger in the small painting, Ecce Homo (Christ Amongst the Critics) (1891, private collection). 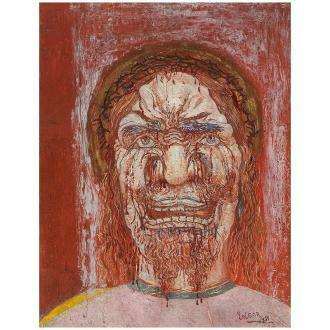 The facial features are clearly those of Ensor himself, but in many depictions of Christ that is not the case. The habit of the artist to depict Christ as an alter ego is thus problematic at the least. Ensor’s most ambitious religious presentations are the five, large drawings and the painting he exhibited in 1887 under the comprehensive title, The Aureoles of Christ or the Sensibility of Light/Visions. In The Aureoles of Christ or the Sensibility of Light, he makes associations with six events from the life of Christ with the expressive quality of light (happy, raw, lively and radiant, sad and exhausted, quiet and serene, intense). In The Entry of Christ in Jerusalem (1885), just as with The Entry of Christ into Brussels in 1889 (1888-89, J. Paul Getty Museum, Los Angeles) he sets the commencement of the Passion Play in a modern European city, amongst a large procession of people, musicians and carnival-goers. According to portraits and inscriptions, Ensor alluded in these works to the political and social questions with which his time was concerned.